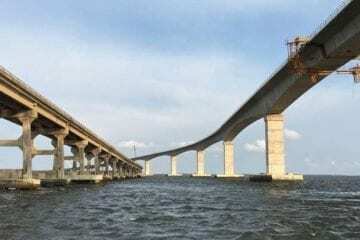 With local towns lining up behind dedicating the new bridge over Oregon Inlet to former state Sen. Marc Basnight, the idea seems to go against the grain of public opinion. An Outer Banks Voice reader survey strongly supports naming it the Oregon Inlet Bridge or keeping the old Herbert C. Bonner title. Marc Basnight runs a distant third. Our survey is not scientific, but you can only vote once from a specific IP address. So, along with the comments, it at least gives us a sense of how 3,000 people are thinking. Some of the arguments against the Basnight proposal, however, miss the point. Buildings, bridges and other structures are given names as an honor, not as an identity. Other political, popular or historical figures should probably be in the mix. But getting down to real life, consider some of our other local spans: What’s the name of the bridge over the Alligator River? Or the causeway bridge between Nags Head and Manteo? How about the bridge over the Intracoastal Waterway in Currituck County? Basnight was a state senator for 26 years and the longest-serving Senate president pro tem in the state’s history. He retired in 2011 because of failing health, but much of what he brought to the region stands as testimony to his influence: Like the Virginia Dare Memorial Bridge — that new bridge to Manns Harbor. Dare County is conducting its own survey. Manteo has passed a resolution favoring the Basnight name. Southern Shores has put the resolution on its agenda for Tuesday and Nags Head commissioners will consider one Wednesday. Kill Devil Hills will vote on resolutions to name the new bridge after Basnight and the piece of the old bridge that will remain as a pier after Bonner, a congressman who worked to establish the Cape Hatteras National Seashore. Odds are better than even that Dare County is going to submit someone’s name, probably Basnight’s, to the state Board of Transportation. But try not to look at it as politics as usual. It is what it is….”The Oregon Inlet Bridge” !!! Thus the name “Herbert C Bonner Fishing Access”. And Marc Basnight was just doing his job and got paid for it. And it just not right to go against the peoples voice (Votes) to practice “Political Brown Nosing”!!! Keep it as it known The Herbert C. Bonner bridge. Let’s get it together and put this baby to bed. The Bonner Basnight Oregon Outlet Bridge. It’s just that simple. Once again, the unofficial peoples champ, Koo Flocks comes to the rescue. I’m surprised no one came up with the idea of “naming rights” for the new bridge. Just like NASCAR races and sports stadiums. Just imagine…the (insert sponsor) Bonner/Basnight Oregon Inlet Bridge! NCDOT missed that one. Honor a veteran statesman who always reached out to provide for those of us in all of Northeastern North Carolina. Marc accomplishes more than any other elected official on the Outer Banks. He is from an outstanding “Local As It Gets “ family and he helped preserve the Outer Banks traditions: , commercial and recreational fishing, hunting, southern hospitality, and Christian values.Name the bridge after Senator Marc Basnight ! Another way for local family names to control the county, such a joke, they already get whatever they want. Time is now to stop these controlling entities. Not Basnight is “right on brother” for the reason you stated ! Ok… if anyone is wanting to name something in dare county for someone who has actually made a difference in dare county ; that has changed the stars for generations to come…someone whom is quite and modest and has moved mountains for countless many…Frank Vrablic has saved the lives of so many kids; has one by one and hours on end, given kids the self confidence and tutelage to enable them to be all they can be. These kids are engineers, mathematician; the brightest and the best; thanks to the hours and patience Frank has; one by one, given the confidence to; made them the best they could be….. we need a Frank Vrablic bridge or at the very least a library…. Bonner Bridge , nuff said!